ANDY LEE: "2012 WILL BE MY BREAKOUT YEAR...I WANT MACKLIN AND BARKER FIGHTS"
"I think 2012 will be my breakout year. I feel like I'm a seasoned pro. Now, I've cemented myself as a contender and now it's time to win a world title and establish myself as one of the best middleweights in the world...I think Martinez is the best middleweight out there just because of the people he has beat, but there are better, younger fighters coming up, like Pirog and Golovkin, and of course myself...I want Macklin and Barker fights," stated middleweight contender Andy Lee, who talked about his future plans and much more. Check it out! BJ: Hi Andy. How's things going? AL: Everything's going great. I'm here in Austria training with Emanuel [Steward] and Wladimir [Klitschko]. Camp is great. I'm getting in shape and getting ready for a big 2012. BJ: You avenged your only loss to Bryan Vera in your last outing. Tell us about that. AL: Well, that was a fight I needed to have. Vera is the only man to beat me, so it was very important to avenge that loss. It was a good fight. He's a tough man, but I boxed him well and got the loss out of my system. BJ: Tell us about what 2012 holds for you. Will we see you get that long overdue title shot? AL: I think 2012 will be my breakout year. I feel like I'm a seasoned pro. Now, I've cemented myself as a contender and now it's time to win a world title and establish myself as one of the best middleweights in the world. BJ: Andy, there are talks of you fighting Julio Cesar Chavez Jr. next year. What's the situation with that? AL: So far, it has only been internet speculation, but that is a fight I would love. He is improving with every fight and looked good against Manfrado, but I'm not sure Top Rank would put him in with me. BJ: Andy, who do you see as the best middleweight and who do you want first, Martinez or Chavez? AL: I think Martinez is the best middleweight out there just because of the people he has beat, but there are better, younger fighters coming up, like Pirog and Golovkin, and of course myself. 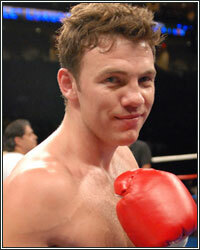 BJ: What are your thoughts on Macklin and Barker as fighters and future opponents? AL: They would both be big fights for me and I can see them happening within the next year to 18 months. If any of us wins a title, then a defense against any of the other two will be on the cards. I want Macklin and Barker fights. BJ: You have not fought in England. Are we ever going to get to see you fight over here? AL: Well, I was born in London. I've spent quite a bit of time there recently and re-familiarized myself with the city. I would like to fight there again. There is great support in England for boxing, but not a great standard of boxing in general. I would like to fight there some time and showcase my skill. BJ: Are Felix Sturm or Daniel Geale on your radar? Would you fight in their hometown for a shot at the title? AL: Within the next 6 months, a fight with either of them will be on the cards. Both are good boxers, but I would like my chances with either of the two. BJ: Any final comments for your fans Andy? AL: Just to say thanks to all the people who follow and support me. And thank you guys for getting in touch.